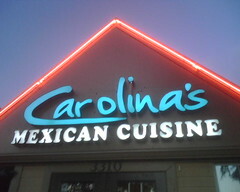 Ogre wanted to try Carolina’s, the restaurant that has taken the place of Mario’s Chiquita on 75 over by Chuy’s. Sounded like a great plan to me. We all loaded up and headed over. The kids were excited about it as we drove up to the restaurant until they realized we were NOT going to Joe’s Crab Shack. Oh well, just a few more days, kids! We were seated right away as the restaurant was not very packed at all. Ogre’s first comment was that he wondered if the cards would still be up on the ceiling. Nope. No sign of the old Hofbrau House any longer. The interior of the restaurant looked pretty generic, but they did have a lot of patio seating. We ordered the appetizer special and looked over the menu. The kids brought in some stuffed animals from the car and busied themselve with their imaginations. They thought it was cool to be able to see down on to some other tables, but it made me a little nervous. We ordered dinner and our 5 layer dip came to busy the kids’ mouths. We also enjoyed it. Dinner came out shortly thereafter and the kids ate very well. No misbehaving tonight. Benji and Mina both liked the flautas and did not require any prodding to eat. 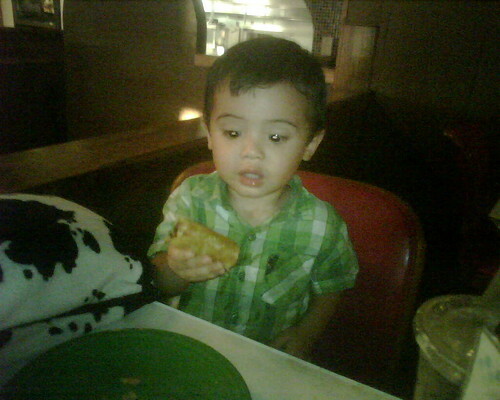 In fact, Benji asked for rice, rice and more rice tonight! And beans, too! After dinner, we ordered the flan. 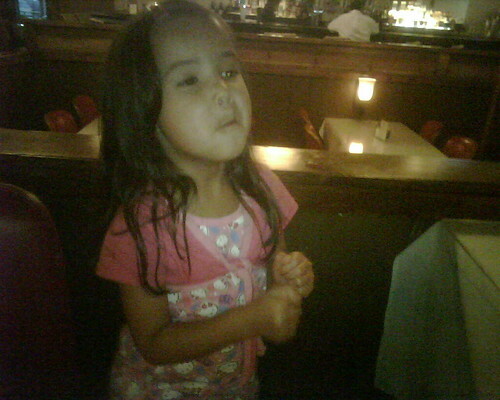 Mina danced her crazy dance while we waited for the flan. I think it is her I’m excited that we’re ordering flan dance. Ogre joked that I should order my own. And we quickly found that we should have. Mina never eats faster than when she eats flan and Benji was diggin it, too. 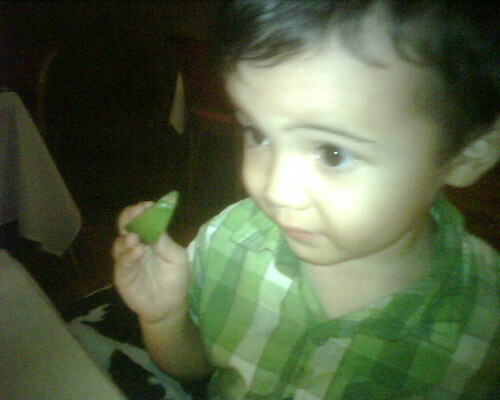 When it was gone, Benji was a little sad, but some lime cheered him up as we settled the bill. We ordered their 5 layer dip (it was the special of the day) -ground beef, guacamole, sour cream, beans, and cheese. It was the nicest presentation of dip that I’ve ever seen! And it was quite tasty! Not as good as Chuy’s Queso Compuesto down the road, but definitely yummy. I ordered the Chicken Enchiladas Verde (I’m sure they call it something else). I thought it smelled better than it tasted, but it tasted average to above average. The verde sauce was nice and tangy and the chicken was juicy. The rice it was served with was very good and deserves mentioning as everyone at the table liked their rice. Ogre ordered the Fish Tacos and thought they were good. He actually thought it was too much food as it came with four tacos! They were a little on the spicy side, but he liked that (he described them as having a lot of chili flavor). The kids had the chicken flautas and they liked these. They liked dipping it in the 5 layer dip!! We ordered the flan (mainly because this restaurant was a Mario’s Chiquita and I thikn the best flan is from that restaurant) and we were pleasantly surprised. Great flavor, but still a little too dense for me. It was still one of the better flans I’ve had! Average. Not awesome, not bad. As expected. Food comes out at a good tempo. No kids activities, but they did have kids menu items. It’s not super laid back, but it’s casual enough that I don’t think bringing kids is frowned upon. We will probably be back, but I don’t know how long this restaurant is going to last here.